Goldfinger Law services Northern Ontario. We are pleased to offer services to accident victims and disability claimants in Thunder Bay and the surrounding area. There aren’t that many personal injury lawyers in Thunder Bay. Goldfinger Law has been pleased to fill the demand in the area for years. Thunder Bay is the largest City in Northwestern Ontario, and, with a population of around 109,000, is the second largest city in Northern Ontario next to Sudbury. Thunder Bay was originally settled as a fur trading post by the French. It then grew into an important shipping port for materials and resources from Western Canada through the Great Lakes area. It also boomed through the forestry industry and the manufacturing industry. But tines have been tough on Thunder Bay. It’s replaced its manufacturing with a more knowledge based economy as it’s the home of the Thunder Bay Regional Research Institute, Thunder Bay Health Sciences Centre, Lakehead University and Confederation College. Thunder Bay aka la Baie to Tonnerre as it’s known in French was formed when the cities of Port Arthur, McIntyre, Neebing and Fort William amalgamated in 1970. Port Arthur and Fort William are still distinct neighbourhoods within Thunder Bay which add a lot to the City’s charm and character. Both Port Arthur and Fort William have their own business districts, suburbs and downtown areas. Thunder Bay certainly has a lot to explore. When a car accident happens in Thunder Bay, accident victims are taken to the Thunder Bay Regional Health Sciences Centre. This is the lone hospital in Thunder Bay. There used to be two hospitals. When Thunder Bay had both hospitals, there were more beds for accident victims and patients to stay. Despite the fact that the new hospital is very nice, modern and wonderfully renovated, local contest that the new Health Sciences Centre is more a centre for research, rather than a hospital to serve the medical needs of the community. Did you know that the highest concentration of Finnish people in Canada live in Thunder Bay? Thunder Bay’s Finnish population is only second to Toronto, but it’s concentration of people who claim Finnish ancestry is certainly higher. Goldfinger Law is proud to serve Thunder Bay. Just because Thunder Bay is remote in comparison to the rest of Ontario, doesn’t mean that it’s citizens should be shut out from getting quality legal services for their personal injury or car accident cases. If you or a loved one in and around the Thunder Bay area is looking for a personal injury lawyer, look no further. Goldfinger Law is proud to serve Thunder Bay and the surrounding area. 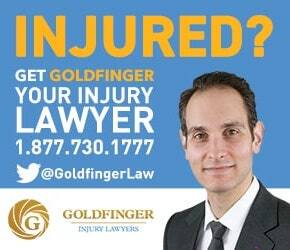 Contact one of our personal injury lawyers at 1-877-730-1777 or info@goldfingerlaw.com, and we will set up a free consultation with you. We would be pleased to meet with you in Thunder Bay.